“The Inspired by Muhammad campaign is designed to improve the public understanding of Islam and Muslims. It showcases Britons demonstrating how Muhammad inspires them to contribute to society, with a focus on women’s rights, social justice and the environment”. Please find below a video and a transcript of video by Dr Amina Coxon, a British Physician who is inspired by Prophet Muhammad (pbuh) and his healthy eating habits, his exercise, and his balanced way of life. I hope you will find this as inspiring as I did. Human is born with a free will. Please don’t sit around with your Eating Disorder and expect a miracle, you have to fight it. Whether you decide now to work at change or to continue with unbalanced life under the shadow of the demon of Eating Disorder will result from a decision made by you. |Choice is yours. This change is not question of one decision but of numerous smaller decisions that you will make over the following days, months, and years. Inspired by Prophet Muhammad (pbuh)- Indeed a simple lifestyle reflects rightness of heart. Living a simple life inspired by the beloved Prophet Muhammad (pbuh). Practicing the Eating habits of Prophet Muhammad (pbuh). Taking care of your health, your body the way Prophet Muhammad (pbuh) did. Follow the eating guidelines from the Qur’an and Sunnah. This diet is based on whole foods mentioned in Qur’an and consumed in the times of Prophet Muhammad (pbuh), mainly olive oil, milk, barley, dates, yogurt, fruits, herbs, whole grains, organic produce and grass-fed meats. In Prophet Muhammad’s times they did not have a means for processed foods as we do today. They also walked everywhere they went and worked longer hours in farms, so exercise was plentiful. It’s amazing, how thorough Islam is and how precise Islam is when it comes to eating and taking care of health, body, mind and spirit. Prophet Muhammad had a great respect for food. He had favourite foods and enjoyed eating, of course everything in moderation. Muslim health is about having a strong relationship with God and about keeping your body and mind in the best possible shape. Amina Coxon, a consultant physician at Harley Street London has been a doctor for almost 50 years. She has seen enormous changes in medicine in the treatment available for complicated diseases. “The more mature I get in medicine, the more I realize that we are bringing on our selves a lot of our illnesses through unhealthy lifestyle. The 13th century Bimaristan al-Mansuri Hospital in Cairo accommodated 8,000 people. During the time of the Prophet people had to walk a lot. They thought nothing of walking 10 miles or working on the farms for long periods of time. And I understand they were mainly thin. The current culture that we live is the culture that doesn’t encourage people or doesn’t allow people to take exercise as part of their daily life because now every thing can be done mechanically. So now exercise is something we add on as something extra and people don’t have time for it and within our life styles we get stressed. How do we calm ourselves? We eat too much and get mellow, Oh it’s lovely, but then inevitably we gain weight. In Islam we are taught balance, you are not to eat fast, you are to get up from the table with a felling that you have not had quiet enough. There was a sense always of containment and modesty and moderation. Islam is the middle path. Do not go to extreme either of greed or starvation. In time of the Prophet Muhammad, the travelers to Arab countries were surprised, the orientalists were surprised that when you’re going to an immense crowd of people who are traveling and they are busy and everything and how fragrant everyone was, unlike European countries where you could smell open sewage and everything, they used perfume to conceal odor. The Arab people washed five times a day and they were clean and their hands were clean and their clothes were clean and this was a big surprise to the European. It was quiet unknown to them in their own personal hygiene. 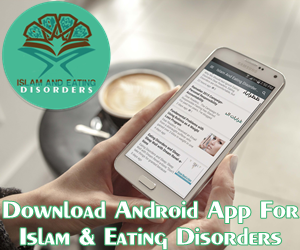 Can we Beat Eating Disorders by following the lifestyle example of Prophet Muhammad (pbuh)? In Eating Disorders there are two extremes and both of them are destructive to health. Though Eating Disorders are not about food, but food is used as a weapon to inflict destruction on one’s overall well-being. Overeating leads to stomach-upset and/or obesity. Underrating leads to malnutrition or starvation. In the time of Prophet it was necessary to teach each individual , how important they were not just part of a tribe but they were uniquely special to Allah and everything about them must be respected as a vessel of Allah’s creation. Within that matrix came an understanding that your body and your health is a great great gift. As a matter of fact, if more people were to consume whole foods and eat less refined and processed foods I think we would all notice a change in our overall health and we would definitely be taking a step towards defeating all kinds of Eating Disorders. Look into the lifestyle of Prophet Jesus (as) and he ate in moderation all wholesome foods and exercised daily. He was a shepherd and practiced great care with his body and his eating. You are never going to live a good, healthy, happy, balanced life, if you don’t exercise a balance in your life. My Personal Experience, no-way you’ll become obese or gain weight, if you follow these guidelines. I’ve put this into practice. I am someone who would not even eat a single grape without having a fear of weight gain. Two Days ago, I was at a friend’s house and she cooked lunch, mushroom soup with homemade bread, fresh olive oil from Tunisia and smoked cheese. First thought that went through my mind, what Prophet Muhammad (pbuh) said: ‘there is a blessing in two things, early morning meal, soup and a bread”. It’s not about calories or grams of fats, or carbohydrates, it’s all about balance. Alhamdulilah. Your body responds beautifully to balance. Some habits are hard to get rid of. It is easier to learn good habits than to unlearn bad ones. All I can say is try to create new habits by introducing concept of balance in your life. Everything associated with Eating Disorders are unbalanced. Try to strike a balance in your diet and exercise and Inshallah rest will follow. I promise you that. The demon of Eating Disorder will try to lead you astray from this path of happiness and well-being, you will make many mistakes, you will have dark gloomy days; after all you are a human and fallible. However, this will give you an underlying opportunity to learn from your mistakes and grow as a person. Happy Journey to Recovery and Good Health. Thank you ever so much. Your words and recognition is the reward. I am deeply touched. Hi there, its pleasant post about media print, we all be aware of media is a wonderful source of data. Hi Sheryl. There are videos on YouTube by DDR Amina Coxon. She’s a physian at Harley Street Clinic London. She’s your perfect source of information. Thank you Amy. Yes sometimes we have to look at things from non ED angle. Message simple rise up and face the Demon . Everything is achievable and we all need to believe in ourselves and support each other in recovery and in other areas of life. my presentation subject, which i amm going to present in instittion of higher education.